Bank account details: payments are securely processed by Stripe and benefit from the payment escrow service. PayPal: payments are processed by PayPal and have PayPal buyer and seller protections. You can provide no, one, or both payment options. We strongly recommend that you provide at lease one payment option if you are selling an item, and recommend that you enter your bank account details if selling an item so that you can benefit from the payment escrow service. We are currently consulting on the future of the PayPal payment option. Using the service enhances buyer confidence and items that use this service are more likely to sell. To use the escrow service add your bank account details. 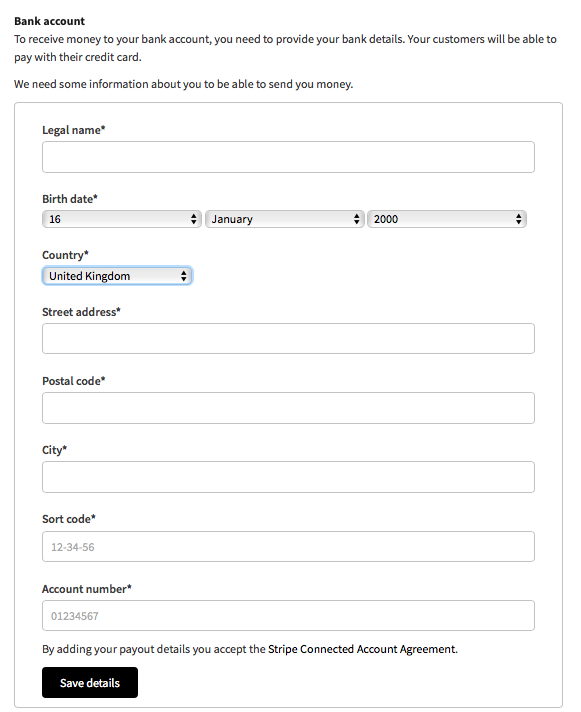 An example of the bank account details set up. Buyers will see a buy button on your listings, with the Visa, Mastercard and Amex logos along with powered by Stripe. The buy button for payments which will be processed using the escrow service. Once they click buy, they enter their shipping and payment details and the transaction is processed. There is an cost incurred by United Baristas to offer this service to Marketplace users, which we need to pass on to our users. The fee is paid by the seller, and the point of sale. We review these fees periodically to ensure that we are covering our costs. These fees a significantly cheaper than transaction fees currently incurred by our users for receiving funds with PayPal. We encourage all sellers to transfer to the new system as soon as practicable. A verified PayPal account is required to use the PayPal option on United Baristas. Click, connect to PayPal and follow the steps.